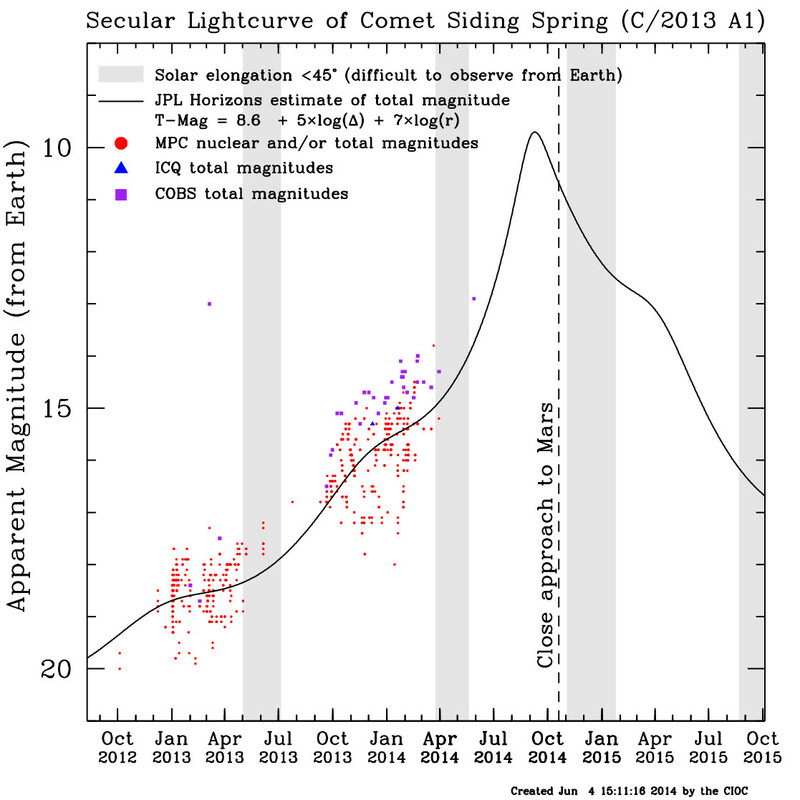 Welcome to the new "Current Status" page for comet C/2013 A1 (Siding Spring)! This page should look quite familiar to those of you who followed along with the Comet ISON Observing Campaign, as we has a near-identical page on that website too. It was actually the single most popular page on the website, and clearly demonstrated that not just the astronomy community, but also the public and media, appreciated having a regularly updated page that provided a brief-but-useful status of the observing campaign target. So we're going to do the same thing again for this campaign. At the moment, Comet Siding Spring is just beginning to emerge out of twilight after being blocked by the Sun for a while. This still makes it a tricky observing target, but that should improve quickly over the coming weeks. Right now it seems to be a healthy-loooking mag-12 comet, pretty much in-line with the model brightness, if perhaps marginally ahead of the curve. While we don't want to belabor the whole Comet ISON thing, we know a lot of people following this campaign will use the ISON Campaign as their only reference point. So we'd like to just take a moment to emphasize that Comet Siding Spring is a very different beast to Comet ISON. It will not be encountering an environment anywhere near as hostile as ISON did, the latter being a sungrazing comet that flew extremely close to the Sun. Comet Siding Spring is never going to get particularly close to the Sun and thus is at far less risk of fragmentation or disruption than ISON was. Yes, it will be going close to Mars, but not nearly close enough that the Martian gravity could stress the nucleus and break it up, and certainly not close enough that there's any chance of hitting Mars. In general, this event has fewer unknown than the ISON event but still holds lots of intrigue and tremendous science potential (which you'll hear about in the blogs over the coming weeks). Beginning now we do expect there to be an increase in observations and information available for this comet. Likewise you will now begin to see an increase in the rate at which content appears and updates on this website. For Comet ISON, we found it handy to maintain an archive of the "Current Status" page so that we could refer back to previous thoughts, analyses, events, etc. We plan to do the same with Siding Spring. So over time, expect to see a list of archived snapshots of this page listed here.